Home / Why Choose Our Hydrobath? The Barf Shop hydrobaths are manufactured to the highest possible standard using only the best materials available, to ensure the 100% satisfaction, performance and durability. We have designed and manufactured our hydrobaths for heavy duty application and long term commercial use in mind. Unlike other brands, we include all required parts as standard and don’t charge any extra; some of the items our hydrobaths come equipped with include trolley, drain valve, filters, element protection switch, auto-fill function and many more accessories without any hidden costs and no extra charge! Because our hydrobaths have been extensively tested and proven over time we are able to offer the longest warranty available on the market. We offer 24 months warranty* and guarantee that our hydrobaths will never chip, crack or fade for the lifetime of your hydrobath. Our hydrobaths are also the most water efficient hydrobaths on the market – designed to wash with only 10L wash tank. 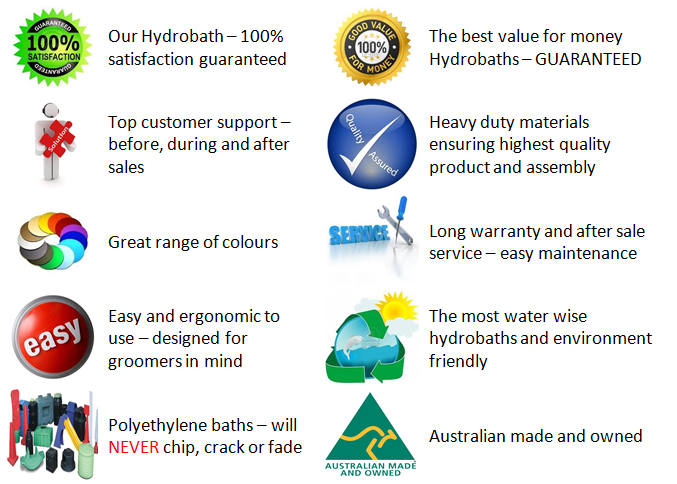 In the past 10 years, our hydrobaths have become the leading product on the market when compared to other hydrobaths in every aspect ranked by quality, value, efficiency, durability and overall satisfaction!